In the middle of June as you can see we had the moon brightly illuminating the night, as it was the closest it has been to the earth for many years. It certainly was bright over the last few nights, not quite enough light for cricket though. On this morning the moon waited a little longer to set and it lent itself to a lovely crisp winter morning and the remnant of the night just ended. All this may be very nice but the hard work still continues at the winery. 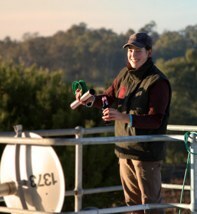 The tank samples still need to be done and here you can see Marion, rugged up on top of the tanks getting a sample to analyse later in the lab. It is a lovely view from the top of the tanks, why don't you come over and have a look for yourselves sometime?